Tottenham Hotspur's Son Heung-min (£7.6m) helped inflict a first defeat on Manchester City but the main beneficiaries of the Fantasy Premier League bonus points at White Hart Lane were between the sticks. Claudio Bravo (£5.5m) earned the maximum three points, scoring 39 in the Bonus Points System. The Manchester City goalkeeper could not prevent a first Premier League reverse under Pep Guardiola but denied Erik Lamela (£6.9m) from the spot, and made a total of six saves. 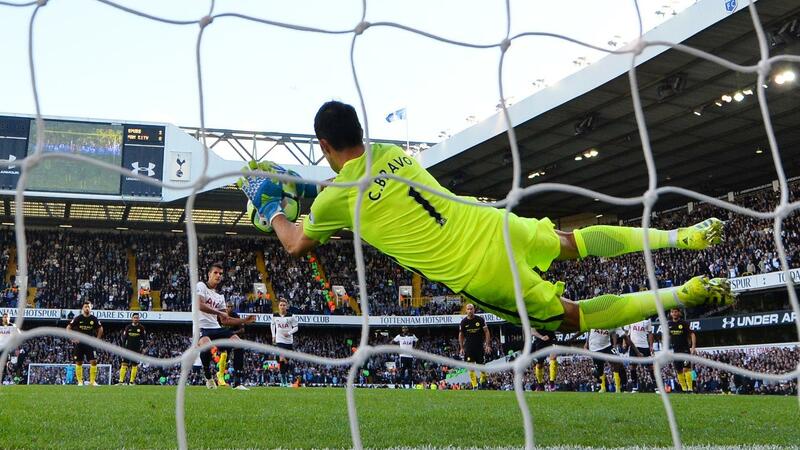 Hugo Lloris (£5.4m) was awarded a single bonus point for Spurs. The Frenchman scored 34 in the BPS, producing six saves to help his side register a fourth clean sheet of the campaign. Danny Rose (£5.9m) split the two stoppers, receiving two bonus points with 35 in the BPS. Having recovered from a hamstring problem, the left-back recorded the assist for Spurs' opener after Aleksandar Kolarov (£5.9m) diverted his far post cross past Bravo. Rose supplemented this with four successful tackles and nine clearances, blocks and interceptions (CBI). Sergio Aguero (£13.1m) was ranked first in the ICT Index at White Hart Lane, with 10.8. The Manchester City striker fired seven attempts on goal, with four inside the box and as many efforts on target. Aguero earned a Threat score of 91 in the Gameweek - only Manchester United's Zlatan Ibrahimovic (£11.5m), with 135, boasted a higher tally. Son (£7.6m) was placed second with a score of 10.0. Handed the lone striker role by Mauricio Pochettino, the South Korean provided the assist for Dele Alli's (£8.2m) goal and fired four attempts, with three arriving in the City penalty area. Pochettino's decision to field Son up front saw Vincent Janssen (£7.8m) drop to the bench as Lamela started for the first time since Gameweek 3. Son has earned more transfers in (79,000+) than any player in the Gameweek, already enjoying a price rise of 0.1 as we head into the international break. Meanwhile, Alli remains largely overlooked. He's dropped 0.3 in price since the start of the season, yet his first-half strike means he has now produced attacking points in three of the last four Gameweeks. Rose returned to the first XI at the expense of Ben Davies (£4.9m) as Spurs extended their unbeaten start. He has averaged 6.5 points per match - more than any defensive team-mate - yet is owned by just 5% of FPL managers. The recent move to 4-1-4-1 means that the fit-again Eric Dier (£5.2m) was afforded a substitute appearance, with Victor Wanyama (£5.0m) continuing as the holding midfielder. The second most-captained player in Gameweek 7, Aguero still carried a significant threat - he produced four of City's six shots inside the box. With Kevin De Bruyne (£10.7m) still uncertain to be fit for the Gameweek 8 visit of Everton, Guardiola may look to recall Ilkay Gundogan (£5.4m) or hand Leroy Sane (£7.7m) a first start, with Fernando (£4.8m) and Jesus Navas' (£6.3m) minutes in question. Having struggled in the midweek UEFA Champions League draw against Celtic, Kolarov's unconvincing display at White Hart Lane could earn Gael Clichy (£5.4m) a recall against the Toffees.